Photo source: Rakeshkurmi85. Some rights reserved. 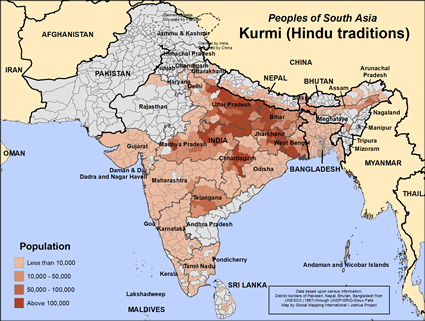 Kurmi is the name given to a Hindu caste residing in India and Bangladesh. The caste system is a pattern of social stratification associated with Hinduism. The word kurmi is related to the word karmi derived from the word karma (meaning action or merit). Defining caste by karma instead of by lineage and birth was a major change in defining caste. The Kurmi are also known as Kunbi. The Kurmi are believed to be descendants of some of the earliest Aryan immigrants to India and come from the Kshatriyas (warrior caste) who later became farmers. Kurmi are known in India as a chief agricultural caste. Those in Bangladesh probably have lower status. Most members of the Kurmi community are in India, but a smaller number live further east in neighboring Bangladesh, a Muslim country. 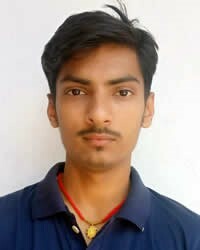 Modern Kurmi in India are relatively prosperous and educated. Their lifestyle is associated with farming and trading. Due to their agricultural link, some people view the Kurmi as one of the "backward" or lower castes rather than as Kshatriyas, a "forward" privileged caste. As often happens among Hindu communities, people try to consider themselves to have high status and caste before other groups, but they also claim low caste status before the government in order to get reserved jobs and placement in colleges. One source describes the Kurmi in Bangladesh as common tea workers, which may or may not be true. A key issue for the Kurmi is their desire to be recognized by other castes as belonging to the high status warrior caste. High caste status gives them a false sense of pride. Most likely this caste consciousness is less prevalent in Bangladesh, a Muslim country where Hindus are a minority. The Kurmi people need the humility to accept God on His terms, which is salvation through Jesus Christ. They also need people to go to them with the gospel, whether they be in India or Bangladesh. * Pray for Holy Spirit-directed workers to go to the Kurmi people in Bangladesh. * Pray that the Kurmi people may realize that Jesus is their only hope for salvation. * The Lion of Judah is offering the Kurmi the right to become a special people if they put their sense of worth in the person of Jesus Christ rather than in caste status. Pray for this to happen. * Pray for a strong church planting movement among the Kurmi people in India and Bangladesh. https://en.wikipedia.org/wiki/KunbiView Kurmi (Hindu traditions) in all countries.